This is a beautiful colour wheel of crisp vegetables. Feel free to switch up with your favourites. Traditionally, salads of all styles are the introduction to the meal. 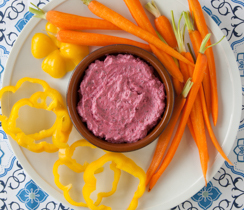 Dollop Moroccan Mint & Beet Dip into a bowl placed in the center of a serving platter. Arrange vegetables in a fan around dip. 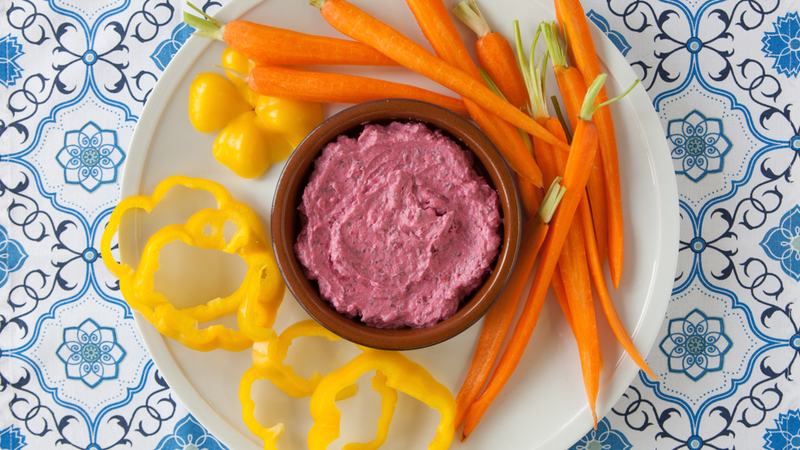 Chef Tip: Give your crudités Moroccan flare. Drizzle with the juice of one lemon just before serving. Mint & Beet Vinaigrette: To make a creamy vinaigrette with Moroccan Mint & Beet Dip, whisk 1/3 cup (80 ml) milk into 1 cup (250 ml) prepared dip. Thin to desired consistency. Try on your favourite greens or Epicure Beet & Orange Salad instead of Moroccan Lemon Vinaigrette.